Electoral Fools - It is the day after April Fools and there is a topic that I have been been meaning to get to for some time. Back in October (of 2011) the Daily Sun ran an editorial from the Los Angeles Times titled, "A president by popular vote." They claim that Al Gore, in 2000, "won the popular vote" and was "denied victory" because of the archaic nature of the Electoral College. Nonsense. There is no such thing as a "popular vote." There is only the artifact of adding up the vote totals for each candidate. But, since the system doesn't work as a popular vote, the total is meaningless. Neither candidate was striving to win a "popular vote." They were campaigning in a way to win the vote of the Electoral College. So, the contention is false, and yet is repeated ad nauseam. The editorial goes on to call for the abolition of the Electoral College so as to make the election "more democratic." It is perhaps the best example of shallow thinking that I can come up with right now. All voting schemes suffer from inconsistencies, paradoxes and inefficiencies. Even majority rule. That's why we have certain rights that majorities can't take away. Even if a majority vote to throw you in jail for burning the American flag, the courts will say that is unconstitutional. So, there are limits to majority rule. Which brings me to the reason for my deferred reaction to this editorial. I had written a letter years ago in response to another like-minded editorial. I hunted around for both off and on since last October and have finally found them. 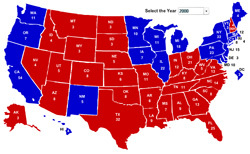 In November of 2000, right after the election, the Daily Sun ran the editorial on this subject, written by Steven Hill and Rob Richie, titled, "Bush, Gore should scrap Electoral College." A second mistake the authors made was to claim that this result is akin to the “loser” in the Super Bowl being declared the winner. Nothing could be further from the truth. The election as it now stands is almost exactly like a football game. The winner of the Super Bowl (presidency) is not necessarily the team that had the most offensive yards (“popular vote”), although that team (candidate) is more likely to have won. Instead, to win the game, a team has to score points (win states). Sometimes they get a big score with a touchdown (New York), sometimes a smaller score with a field goal, safety, or a conversion (Arizona, Maine or Wyoming). The election of senators. The LA Times editorial made a point of saying that if we can directly elect senators, we should be able to directly elect the president. I suppose that is a reasonable comparison, but there is probably no more important cause for our out-of-control federal government than the direct election of senators. The consequence of this Constitutional Amendment was to take a major party to the federal compact - the states - and toss them out the window. That's why the feds can criminalize marijuana, withhold highway money and require national standards in education. Senators, acting on behalf of their states, would not have let these powers flow to the federal government. Democracy is overrated. The point was made above - even majorities can't take away rights that are constitutionally protected. There are limits to the mob. Indeed, the founders crafted a system that was quite separate from a democracy, not that there weren't democratic elements (the direct election of representatives, for instance). Gordon Tullock, in discussing the paradoxes that imbue the political system, writes in Government Failure that "there are few strong positive arguments for democracy." He doesn't claim there is a better system, but we shouldn't be blinded in our adoration of such a flawed system. Who should vote? It may seem like a ridiculous question. But, one has to look at conflicts of interest here. Should people who pay no taxes be allowed to vote for bond issues that affect taxes? Isn't that a conflict? If you pay no tax and are asked to vote on an issue where there are only benefits to you, and no costs, how surprised can we be that you vote to raise someone else's tax? So, should you be allowed to vote? Maybe not! I am wondering whether government employees should be allowed to vote at all. And, I am one. Don't we have a vested interest in perpetuating our situation? Of course. A candidate for mayor (here in Flagstaff) a few years ago said that he couldn't really talk about cutting the staff of the city government because he'd lose 500-1000 votes (employees plus their family and friends)! There is something definitely wrong with this picture! Make all elections subject to a 50% rule. That is, no election is decided if less than 50% of the registered voter base votes in favor. Not just 50% of those voting. So, if 30% don't vote, but are registered, a winner would have to get 71% of the vote in order to win. Otherwise, the election goes to nobody. Isn't that really a better reflection of voter attitudes than to say that these non-voters get no voice? Well, it's an idea. For years Flagstaff has been informally described as "poverty with a view." With the proposed property maintenance ordinance (PMO) perhaps we can finally shed that slogan and replace it with, "Flagstaff -- It's not for everybody!" I am hopeful that the city council will follow this up with a "personal maintenance ordinance" as well that will deal with some of the other eyesores that can be seen around town, especially downtown. I was thinking about calling my proposal PMO-2 and even taking a swipe at pets with a PMO-3. But, I think I made my point. I have read that the city council has passed a resolution to support the so-called 28th amendment to curtail free speech. Funny, I didn’t think that one of the problems our country faces, much less our city, is an overabundance of free speech. Apparently, the first Amendment to the U.S. Constitution, which reads, in part, that “Congress shall make no law … abridging the freedom of speech” is just too generous and what we really need is less free speech. Perhaps the council will also consider a resolution to make burning the flag a crime. After all, the members of the council can’t possibly be for burning the American flag can they? And, let’s also ban the printing of the names of our fallen military heroes on t-shirt protesting the war. Who could possibly be in favor of that speech? Once they have finished deciding how much speech we should have, the city council can move on to religion and assembly, and, perhaps, work their way through the whole of the Bill of Rights. Or, they could take on less weighty issues like finding a way to fix the potholes that are cropping up all around town. Another letter on this subject ran just a couple of days prior and was getting lots of discussion on the web. Mine ran on a Sunday, but has elicited only a few comments. Retooling the KJ - Over the last week I have been doing some fix up work on the Kaibab Journal. That includes a new format for the Grand Canyon Hiking home page, with trip blogs now arranged by area of the canyon. 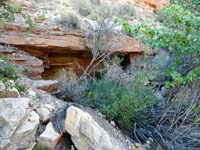 I have also taken some of the blogs that appeared just in the main section of the Kaibab Journal (usually, the newspaper stories I sometimes write) that were about my hiking trips and put them in the Hiking section. Short blurbs still appear in the KJ, with links to their new web pages in the hiking section. You'll also see some new posting over there, which don't always make it into my main blog site. Also, I have finally finished my daily blogs for my Antarctic Journal. Well, that only took years and years! Actually, I only had the last two days, spent in Hobart, Tasmania, to wrap up and I just kept putting it off. Until just yesterday. So, that story is now wrapped up. Or, is it? I still have movies I have been meaning to include but . . .
Lastly, at least for now, I have added a new section, called The Grand Canyon Essays. This is an index page to all of my various essays that have to do with the Grand Canyon. Essays of a political, economic and philosophical nature, that is. All the essays were already here and many had links to others, but this will help me better keep track of this major area of interest to me. I ordered them from newest to oldest, for lack of any better idea in this regard. The very first entry (i.e., the oldest material) is actually the paper I wrote for the Goldwater Institute. It is the only one that doesn't appear in the Kaibab Journal. I have added a link to this section in the center column. I do have some other canyon related sections listed there and I may yet retool some of those pages at a later date. It's Retarded - A couple of months ago a front page article in the local paper was titled, "No more R-word." The accompanying photo showed a couple of high school girls addressing a middle school assembly. Well, I was definitely puzzled by this and at a loss to figure out what the "R-word" was. It must be such a hateful and despised word to have elicited such attention, and yet I am clueless. It turns out that this venal word is "retarded." Say, what?? This is going to fall into the same league as the "N-word" and the "F-word?" What's next? Will we eventually have such a prohibition for every letter in the alphabet? It makes you wonder whatever the "J-word" will be! So, I was immediately remembering how, as a child, my mother used to drill into us the phrase, "Sticks and stones can break my bones, but words can never hurt me." I took it for granted that everyone knew that. But, am I the only one? Well, me and my sisters. The idea of some kind of word prohibition not only infers the intent of some speaker/s, it also gives it even greater weight! That would seem to be self-defeating, at best. Why can't I say that someone is retarded in a purely objective, value-free, manner? Apparently, I can't. And, so, I began to think that this whole issue - of "banning" words - is totally bogus. I am quite accepting of societal norms in this regard, and notions of polite behavior, but it can't be important enough to get this much attention. Just think about it. The uttering of particular sounds through our vocal cords can constitute some kind of hate crime? Is that the issue? And, of course, it isn't a hate crime to those that don't speak the language. To them, it is just so much gibberish. I can't think of a better definition of insanity than a proscription against particular sounds. Indeed, the whole point of that childhood rhyme is to ignore the absurdity of words (or, sounds) in favor of focusing on actions. That is, if someone does attack me physically, that is cause for legal involvement, not if someone's words offend me. I was also reminded of an incident in college. During one of the many false fire alarms we had to put up with, the Resident Assistant for my dorm got into a bit of a verbal dust-up with one of the residents. I don't recall the exact nature of the argument, but the student resident was "charged" with some violation and "tried" before a university judicial council (made up in part, if not in whole, by students as I recall). Well, during the "hearings" the RA claimed that he was being assaulted by this student. When asked how that was so, he replied, "He verbally assaulted me." That sounded ridiculously absurd at the time, and still does. Yet, that is exactly the same mind-set that this "R-word" issue rests on. Recently, I was watching a comedy special featuring Louis CK, who can be rolling-on-the-floor funny. He was expressing his distain for people who use the phrase, "the N-word." That is, he said (Google it on your own to find it), because we are all saying the actual word in our heads! Exactly! Either we know what it means - so why use the euphemism - or, we don't - so, why do it at all? Maybe what we really need to do is force people to say these words every day, so that they will lose their negative connotations? Or, maybe we should just repeat the childhood rhyme about sticks and stones. Otherwise, this whole debate is . . . well, retarded. Romney 335? - The smart money is on a close presidential election come this fall. Of course, that's always where the smart money is! Smart money isn't going to take risks, and picking middle ground just comes with the territory. Excuse the mixed metaphor. So, let's take risks. As we are still two, or three, months away from serious campaigning for the November election, I see definite signs that this closeness will evaporate. Obama has made many missteps as of late, whether he recognizes them or not. He is spending a lot of political capital to hold onto his base, which is never likely to vote against him, but may not vote at all. Instead of a close race, I am thinking it could be something of a blowout, although not as big as 1980 was - the last time a Democrat incumbent lost. In that election, Reagan got the astounding total of 489 Electoral College votes. In fact, I don't think it will be as big a victory as Bill Clinton had over the first President Bush in 1992, when Clinton got 370 Electoral College votes. 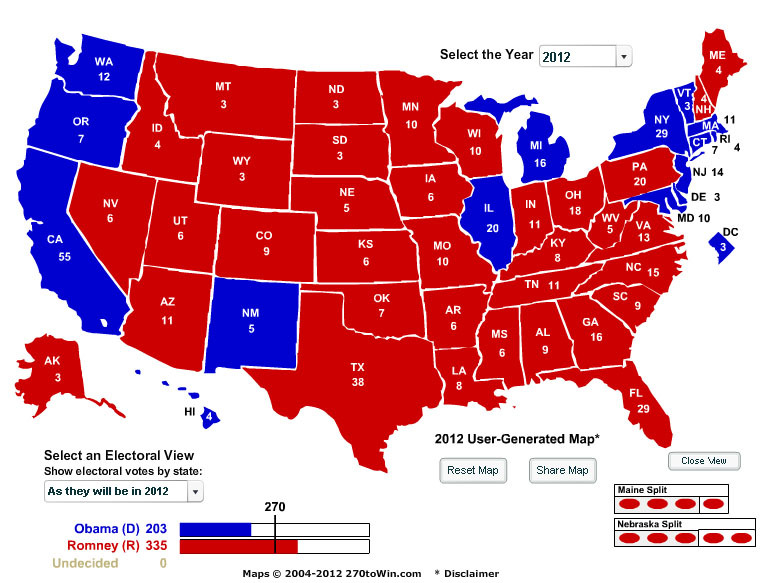 My prognostication has Romney at 335 votes, which is still impressive and, perhaps, more so when you look at the map of his victory, above. [Click to see a bigger version. The map can be replicated at 270towin.] I see him losing the west coast and the bulk of New England, but not much beyond that. I predict he'll capture the Midwest with the exception of Obama's non-Kenyan home state of Illinois and the auto-influenced Michigan. But, I do think he'll sweep up Wisconsin and Minnesota as well as the expected swing state of Ohio. This is just a speculative "what-if?" exercise and I could be totally wrong. But, the problems with the economy, the Attorney General, ObamaCare, the debt crisis (exemplified by European problems), the lack of transparency, the energy swindles and Obama's own cavalier attitude toward the office will not be overcome by pandering to specific voter groups. [I think Presidents almost always become insular and, therefore, delusional.] His call to spend more money just isn't going to resonate like it did in 2008. And, clearly, he can't claim to want to "heal" the nation's divide. No matter what you think President Bush is responsible for, the partisan political divisions we see exhibited today are a direct result of President Obama's actions.